The NL116 & NL121 are ethernet interface devices that can be plugged into the peripheral port on the CR1000 and CR3000 dataloggers. The NL116 also includes a CompactFlash module. They allow a Campbell CR1000 or CR3000 datalogger to communicate with a computer using TCP/IP, making it possible to communicate over a local area network. These devices connect directly to the 40-pin peripheral port on a CR1000 or CR3000 datalogger. 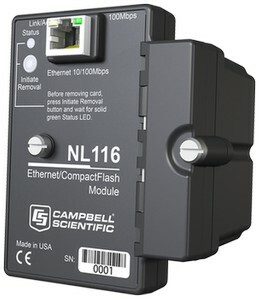 The NL116/CF card combination can also be used to expand the datalogger’s memory, transport data/programs from field site to the office, and store JPEG images when a digital camera is connected to the datalogger. You can retrieve data stored on the CompactFlash card through a communications link with the datalogger or by removing the card and carrying it to a computer. The computer can read the CompactFlash card either with the computer’s PCMCIA slot and the CF1 adapter or the computer’s USB port and the ImageMate Reader/Writer. The NL116 & NL121 replace the NL115 & NL120 respectively. These older models will be available for a limited time until parts run out.